Nissreen in the UK: Cooking! I love cooking and baking. I always wanted to cook. I find it relaxing and interesting activity. Besides, one can see the and taste the results of the efforts done. Today I bought two cooking books. One for baking cakes and the other is for making bread using what is called 'bread machine'. ﻿﻿The first magazine I bought in the UK was a food magazine. May be because I love food and like to try different dishes and recipes. May be because I like colours and arts. may be because I consider cooking is an art and whoever can cook is someone with a vision and talent. Some people consider cooking as a stress relief, other cook when they are happy, others while they are sad, angry or disappointed. Whatever the reasons, people cook! Cooking can be learnt by different ways; you can attend a course, watch a video, buy a book, or even watching you mother preparing your favourite dish in the kitchen. ﻿There are lots of TV programmes about food and even channels for food only. However, the best way to learn how to cook in my point of view is to get involved and get your hands dirty! Practise makes perfect! 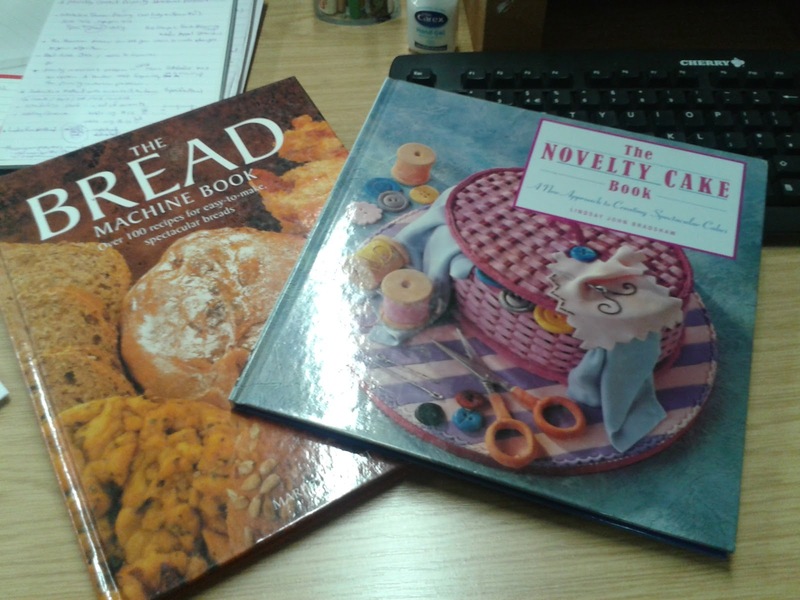 I will have a look into the books and try some of the recipes soon.